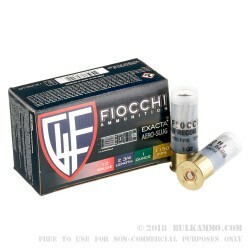 Say goodbye to your achy shoulder with this 12ga Low Recoil ammo by Fiocchi Exacta. The 1-ounce rifled slug is packed into a 2-3/4" plastic shell alongside a 616 primer and Fiocchi's specially selected propellant load. 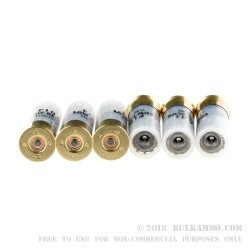 These 12ga shotshells provide impressive accuracy within 100 yards, and the powerful energy transfer caused by the slug makes them an excellent choice for hunting, training, or match shooting. Fiocchi started its nearly 150-year legacy back in the 1880's. Since that time, they have become one of Europe's premier ammunition manufacturers and have expanded beyond Italy into the United States. Fiocchi shotshells are primarily loaded at their Ozark, MO facility. 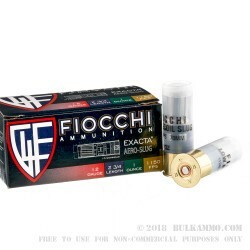 Readily available and extraordinarily affordable, these Fiocchi shotshells are a blast to shoot. Order a few 10-round boxes of this 12ga ammo today! A: Hello Haywood, Fiocchi lists the muzzle velocity of this round at 1150 fps.